Today, Jampp releases a study, Consumer Behavior on E-commerce Mobile Apps, that uncovers in-app purchasing trends on mobile e-commerce apps. Despite the growing mobile app market, new data suggests that user attention spans are waning in today’s on-the-go era, with an 88% decrease in the average time spent on e-commerce apps from Q1 2015 to Q1 2016, with less than 60 seconds being spent in the app. The report also highlights dramatic user behavior differences between different categories of e-commerce apps. Taxi apps have the shortest latency period with 70% of first sales happening on the install date and 80% within the first four days. If a user hasn’t converted within the first seven days, the chances of a purchase are practically nil. Whereas fashion apps have a much longer window of opportunity with only 35% of first conversions happening on the first day of installing the app, and 70% within the first two weeks. The report also investigates various engagement strategies, from push notifications to email messaging. 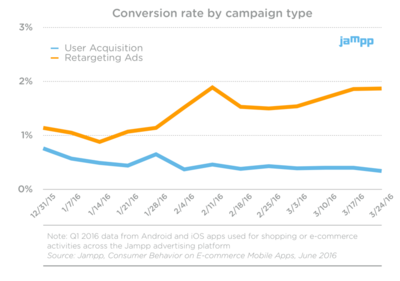 The data shows that retargeting ads are at least twice as productive as user acquisition campaigns, with an average of 1.3% conversion rate for retargeting ads compared to 0.6% for sole user acquisition campaigns. Jampp originally started in Buenos Aires, Argentina, and has been rapidly expanding to the US. (they are already present in Europe, Latin America and Africa). After raising a $7M Series A round last year led by Highland Europe, they added Clay Kellogg (Admob, Chartboost) to their board and hired Rami Richards (formerly Pandora) to head their San Francisco office. The company helps mobile app advertisers drive purchases and in-app activity through their real-time bidding technology for user acquisition and retargeting. They have been driving the growth of some of the largest e-commerce companies globally, including Boxed, Souq, Namshi, Netshoes, OLX, Despegar and many others. To access the full report, Consumer Behavior on E-commerce Mobile Apps, please download it here. For more information on Dynamic Product Ads for mobile apps, visit http://products.jampp.com/dynamic-product-ads. "“As we are bombarded by alerts and notifications from our devices, it is not surprising that consumer attention spans are shrinking to dangerously short moments. We are rapidly becoming like Pavlov's dogs reacting without thinking to a deluge of communication and information.” " Dr. Larry Rosen, international expert in the "psychology of technology" and co-author of the upcoming book, The Distracted Mind: Ancient Brains in a High-Tech World with Adam Gazzaley, MD, Ph.D.
"“There is a short window of opportunity right after a user installs an app in which the chances of that user making a purchase is at its maximum. If advertisers only run user acquisition campaigns, even when optimized by the most active users, they are not enough to drive purchases on their own.” " Diego Meller, CEO and Co-founder of Jampp. 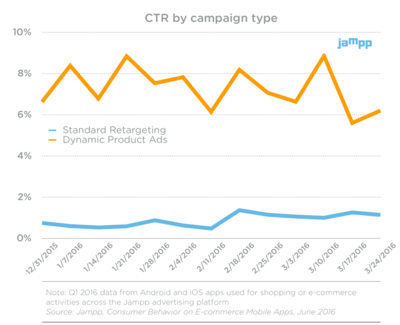 Jampp, a platform that helps mobile app advertisers acquire and re-engage their users globally has raised $7 million in a Series A round led by Highland Europe.